Looking for the best coffee pot cleaner? 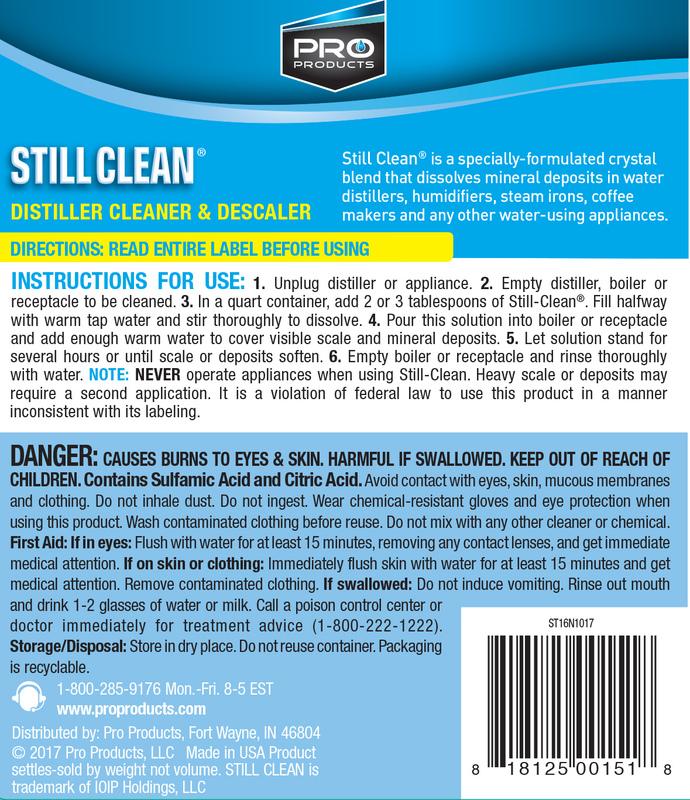 Still Clean is a specially formulated crystal blend designed to dissolve mineral deposits in water distillers, humidifiers, steam irons, coffee pots and any other water using appliance. 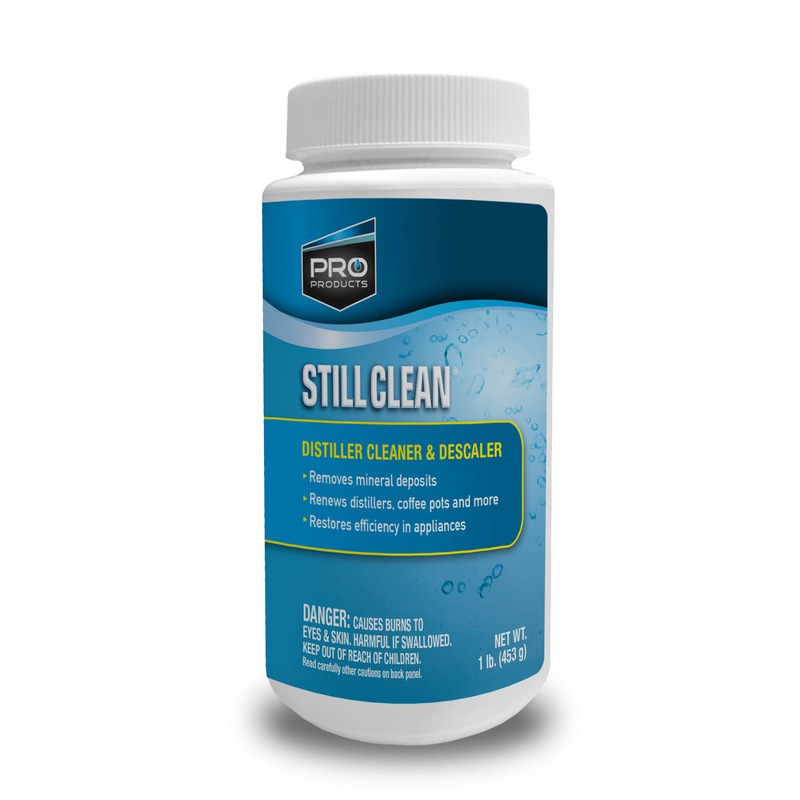 Still Clean is designed to clean mineral build-up, restore energy efficiency and increase the life of water using appliances. It is especially useful as a coffee pot cleaner. Available in 16 oz. size. As a Water Distiller Cleaner: Unplug distiller. Fill water tank above mineral deposit line and add 4 tablespoons of Still Clean per gallon of water. Let sit for 12 hours. Drain and rinse thoroughly. As a Coffee Pot Cleaner: Dissolve 2 tablespoons of Still Clean in 1 quart of water. Add solution to the coffee pot and set for brewing. Repeat using plain tap water. As a Humidifier Cleaner: Dissolve 4 tablespoons of Still Clean per 1 gallon of water and fill humidifier to just above the mineral deposit line. Let sit for 12 hours then empty and rinse with tap water. As a Steam Iron Cleaner: Dissolve 2 teaspoons of Still-Clean to 1 cup of water and pour into steam iron while in an upright position. Place steam iron into a heat resistant dishpan, plug in and let steam for 2-3 minutes. DO NOT EXCEED 3 MINUTES. Unplug! Place iron in a horizontal position supported above the dishpan and allow solution to drip out of steam holes for 30 minutes. Wipe away any traces of liquid from the bottom of the iron.